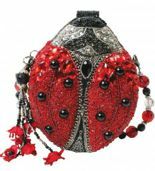 DESIGNER HANDBAGS: Mary Frances, INZI High Fashion. 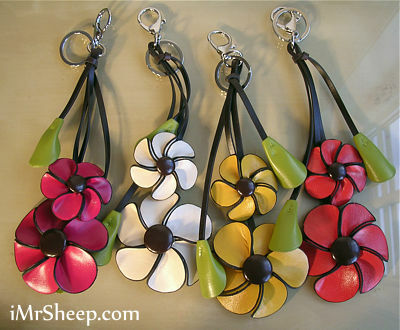 HANDBAG CHARMS. 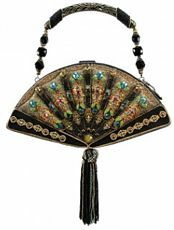  Each item is shipped in guaranteed excellent condition.  Shipping is free for orders over $350. 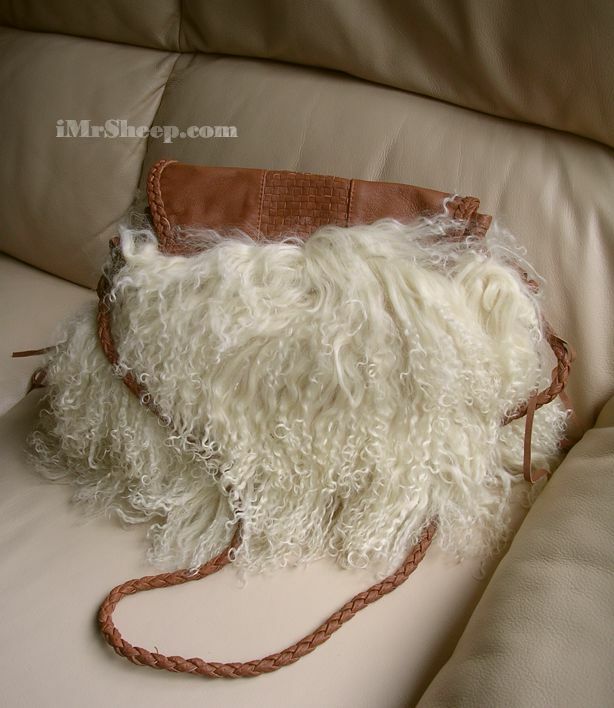 Photography © Irene & Mr. Sheep Co.
 Materials: Full-grain leather, satin fabric lining, resin beads.  Features: Magnetic strap closure and/or Top clasp closure, Removable chain link strap (hidden inside for Mini), Non-removable top handle, interior slip pocket - fits cell phone.  Material, Good Jeans Mini: denim fabric, fabric lining, resin beads.  Material, High Contrast Mini: upholstery fabric, handmade lace, fabric lining, resin beads. 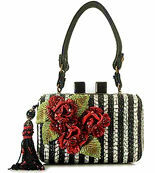  Care: Spot clean with natural stain treating wipes », or professional clean for fine handbags. Colour: Taupe Fleece, Chocolate Brown Leather. 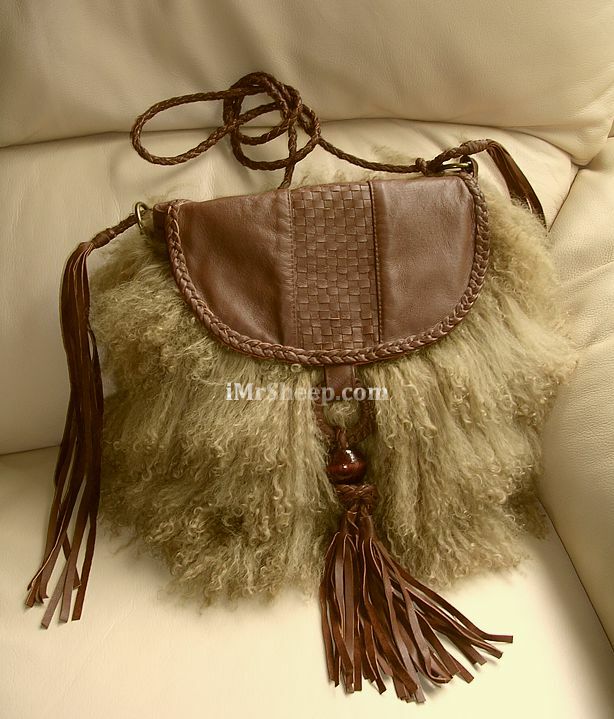 Material: Genuine Natural Brown Longhaired Mongolian Lamb and full grain genuine leather. Measurements (cm): 34 (L) x 14 (W) x 26 (H, approx 32cm with fleece), strap - 112cm or 93cm (56cm or 47cm height). 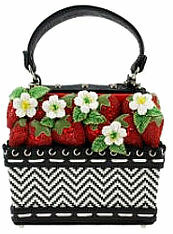 Details: reinforced cross-body length strap knotted to the bag; reinforced genuine leahter base; magnetic closure, bag tassel: mould - cherry wood (lacquered), fringe - genuine leather; 3 inner pockets: 1 zip compartment, 1 cell phone size, 1 wallet size, enlarge, back, inside 1 / inside 2 / inside 3. Made In Italy, Certified. Care: professional dry clean for fine handbags such as Dove Cleaners. 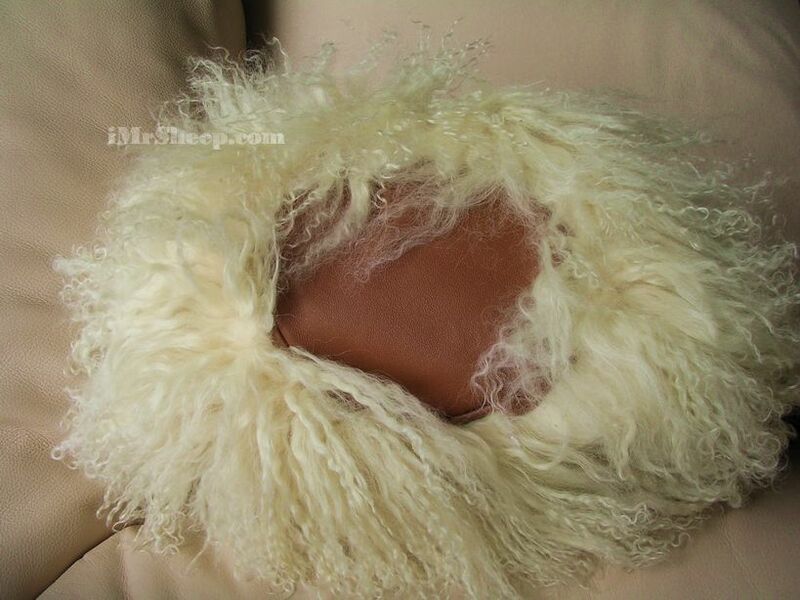 Colour: Natural White Fleece, Cognac Leather. 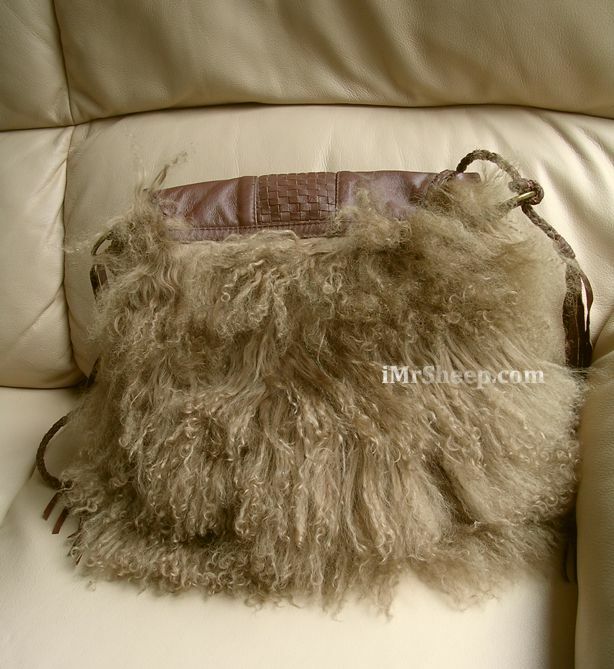 Material: Genuine Natural White Longhaired Mongolian Lamb and full grain genuine leather. Measurements (cm): 34 (L) x 14 (W) x 23 (H, approx 30cm with fleece), strap - 93 cm (47cm height). 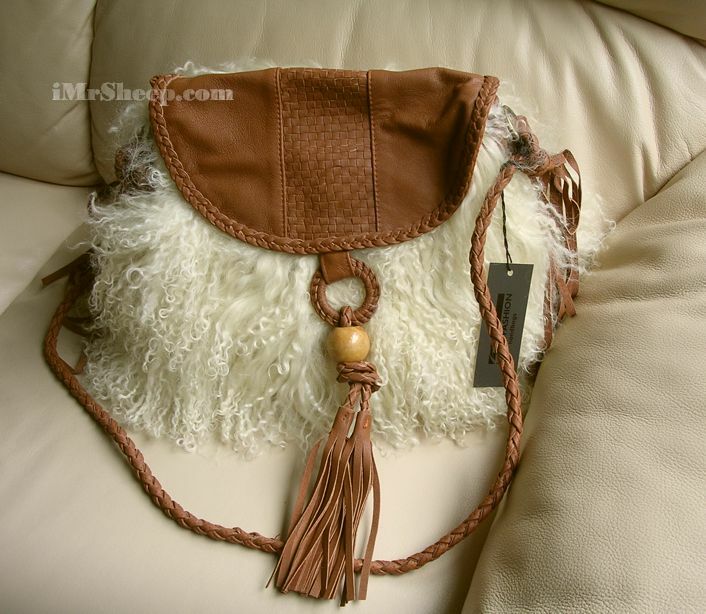 Details: reinforced shoulder-length strap knotted to the bag; reinforced genuine leahter base; magnetic closure, bag tassel: mould - maple wood (lacquered), fringe - genuine leather; 3 inner pockets: 1 zip compartment, 1 cell phone size, 1 wallet size, details: enlarge, back, base, inside 1 / inside 2 / inside 3. Made In Italy, Certified. Care: professional dry clean for fine handbags such as Dove Cleaners. 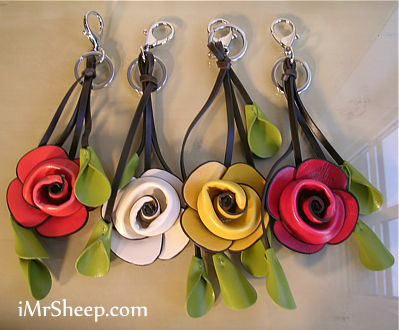 HANDBAG CHARMS: Vegan leather 3-D Flowers. Each charm includes a clasp and a key ring. Styles: Two Daisies, One Rose, Three Tulips. Colours: Pink, Off White, Amber, Red Orange. Colours, Tulips: Red or Red + Purple.